Kingsley Jones has announced his roster for the South American trip to Uruguay and Brazil in February, the teams departs January 26th. Some interesting insights in the roster listing, even though we knew Djustice had signed with Seattle Seawolves we haven't seen the official announcment yet, the same with Noah Barker with Glendale Raptors. Ray Barkwill is listed as Unattached so the chances of him returning to Seattle look slim at this point. Andrew Coe obviously out of contention for the 7s trip to Hamilton/Sydney later this month even though he went on the South American 7s tour with the Maple Leafs. Justin Blanchet a new addition, listed from Bedford Blues, originally from Quebec. This is his bio from Bedford Blues. 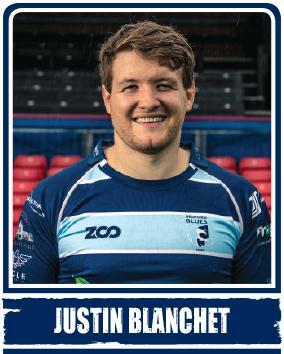 Player Profile: French-Canadian Justin Blanchet joined the Blues in the summer of 2014 from Exeter Chiefs, where he played while studying Economics at University, making his debut for the Premiership side against London Welsh in the LV=Cup in 2012. Blanchet has been a solid performer in a Blues jersey and has often gone above and beyond when it comes to putting his body on the line for the team. Never backing down, Blanchet can chop the biggest of opponents down to size and has firmly established himself in the Bedford squad. Standing at 6ft 4 and tipping the scales at 16 stone, the Montreal native’s impressive displays while at Uni saw him training with the England Under 20 squad, gaining him the reputation of a hard tackling back rower. Will Kelly also gets called into the side as a flyhalf option - Pat Parfrey as the veteran, other options at #10 Theo Sauder and GDT. Phil Mack is staying with the Seawolves so Will Percillier and Jamie MacKenzie get the call at scrum half. Dustin Dobravsky works his way into the side after being left off the World Cup repechage team last year. Nakai Penny also included as a loose forward. It's a conservate selection, there haven't been any spots left open for local on-form players. Jared Stephens stood out for Vancouver Island Tide vs Seattle Seawolves with Kingsley Jones in attendance but Jones has gone for Fraser, Lesage, Hearn, GDT and Blevins in the centres. Andrew Coe can play various backline positions and the two UBC standouts Sauder and Coe are back playing together, perhaps vying for the same starting spot at fullback. A big workload will be put on the front row in South America and Buydens, Keith, Kotlewski, Barker, and Djustice will handle prop duties while Barkwill and Howard are the hookers. Second rows are Josh Larsen and Conor Keys with Kyle Baillie and Mike Sheppard also able to play 2nd row or loose forward. Evan Olmstead is in NZ with the Auckland Blues and Brett Beukeboom in the UK with Cornish Pirates. LANGFORD, BC (January 14, 2018) – Canada’s Men’s Rugby Team head coach Kingsley Jones has named his 28-man roster for the South American leg of the 2019 Americas Rugby Championship (ARC). “The squad we have selected has a good mix of experience and youth. With less than nine months until the Rugby World Cup, the ARC allows us the opportunity to give some players who played very well in 2018 but missed out on tough selection in November. Whilst it is important we have selected experienced players to help mentain continuity and confidence gained in the recent run of positive performances and victories,” said Jones. Canada will depart for Montevideo on January 26 for the opening two test matches of the series against Uruguay on February 2ndand Brazil in Sao Paolo on February 9th.